Isagenix is a wonderful company that makes effective, cutting-edge supplements and cleansing products. The products are made with the highest quality raw materials. Why Isagenix? What can Isagenix do for me? Nutritional supplements are more important today than ever. Our bodies are forced to deal with greater environmental pollutants (impurities) and we’re undernourished because over-farming has depleted the nutrients from our land and, therefore, produce grown on the land. Vitamin supplements replace the nutrients missing from our food. Cleansing has been practiced for thousands of years in various cultures/countries including India, Egypt and Greece. A cleansed and revitalized body is stronger, resists illness better, is more efficient and performs at a higher level than one that is filled with impurities. 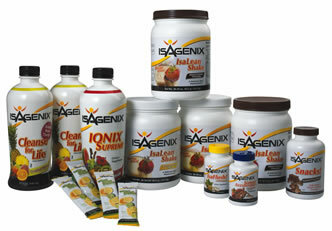 Cleanse, Replenish and Revitalize are the founding principles behind Isagenix's cutting-edge products. The Isagenix products are full of nutrients of all kinds: fiber, healthy fats, probiotics, trace minerals, antioxidants, etc. The products are full of herbs as well: adaptogens to help your body neutralize stress*, herbs to improve digestion*, and herbs to cleanse the entire body*. The Isagenix products are designed to cleanse every system of the body on a cellular level. And unlike other products on the market that may deplete the body of vital nutrients, Isagenix products actually nourish the body as they cleanse. This results in reduced cravings and hunger pangs. The really nice side effect of cleansing with Isagenix is it promotes safe, effective weight loss as well. Nutritional cleansing with Isagenix unlocks the miracle of the human body. The products accelerate the cleansing of impurities from the body. The herbs, vitamins and minerals within them replenish your body with essential nutrients. The result is a revitalized, healthy, energetic you! You can safely lose pounds and inches through nutritional cleansing. These people below did. Learn more or contact me. *The statements on this website have not been evaluated by the Food and Drug Administration. These products are not intended to diagnose, treat, cure or prevent any disease. Results may be greater than or less than those depicted on this Web site and can be influenced by factors including your metabolic rate, energy expenditure, and diet. The average weight loss in a recent study was seven pounds in the first nine days using the 9 Day Program. Always consult your physician or health-care professional before starting this or any other health or fitness program. As with any health or fitness program, a sensible eating plan and regular exercise are required in order to achieve long-term weight-loss results. This Web site is owned and operated by an Isagenix Independent Associate and is not endorsed by Isagenix International, LLC. Any opinions on this Web site are that of the individual and should not be construed as a representation of the opinions of Isagenix International, LLC. All content © 2007 Healing Solutions™, Healing Solutions for You™ and Serenity Dylan, all rights reserved. Contact Us.